A panel of experts appointed by the Constitutional Court has sounded another urgent alarm with regard to Sassa’s ability to make cash payouts to some two million social grant recipients after 31 March 2018. In a scathing special report, the panel called out Sassa and former Minister of Social Development Bathabile Dlamini for their lack of appreciation of “the crisis ahead and the need for urgent singular focus”. Incoming Minister of Social Development, Susan Shabangu, has the unpleasant job of cleaning up Dlamini’s terrifying mess. Even more crucial, she needs to urgently attend to the well-being of social grant beneficiaries before the deadline next month. By MARIANNE THAMM. In time to come, the comprehensive reports by the court-appointed Panel of Experts led by the Auditor General to closely monitor the progress of Sassa with regard to taking in-house the R10-billion monthly payment of social grants to some 17-million recipients will stand as a testimony to Sassa and Minister Bathabile Dlamini’s persistent serial, delinquency which has bordered on criminal. The minister’s leadership has been so toxic that the panel, in a scathing special report earlier this month, recommended that due to her repeated failures Dlamini be relieved of her responsibility of overseeing the Sassa Act. The panel suggested that the crucial job be given to “a member of the Cabinet other than the present incumbent”. This, said the panel, had become a pressing necessity. 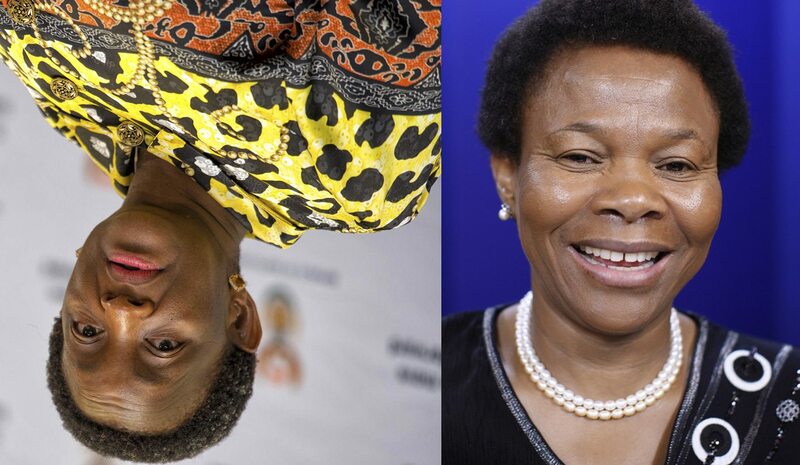 While Dlamini unfathomably survived President Cyril Ramaphosa’s Cabinet reshuffle on Monday night she has been shafted to head the Ministry for Women – current incumbent, Susan Shabangu, a former Minister of Mineral Resources (for which she scored a “D” in the annual Mail & Guardian Cabinet report) now finds herself in the eye of a social grants storm. Cleaning up the mess left by Dlamini will also mean removing her senior henchpeople in Sassa who the expert panel said did not have “the required knowledge, experience or skills, or even the will, to execute the Sassa mandate”. The situation was exacerbated, said the panel, by the exclusion of competent employees from decision-making structures within Sassa. These are the people Shabangu needs to seek out and trust to help solve the self-made crisis which threatens one of the ruling party’s flagship programmes. Dlamini’s wrecking ball of a term in office will also be recorded in various court judgments since 2013 when the tender awarded to Net1 subsidiary Cash Paymaster Services was declared invalid due to the company’s dodgy BEE credentials. Then there is the fact that a US-listed company profited from a job – the distribution of social grants – which should ideally be a function of the South African state. CPS, as an organ of the state, has also been accused of profiteering as well as abusing its position to offer personal loans to recipients of social grants though its EasyPay Everywhere accounts. All of this happened on Dlamini’s disastrous watch. The truth as to why Dlamini acted with such disdain for simple oversight of her crucial work, or the smallanyana skeletons she might be hiding in this regard, might never emerge fully into the light. What Shabangu will find as she hits the tarmac is that with a month to go before the phase-out of CPS, there is still little certainty with regards to Sassa’s agreement with SAPO for the distribution of grants from 1 April, as well as who will manage the payment of cash to those recipients without bank accounts. The special report by the panel set out Sassa’s continuing failures in spite of the urgency of the deadline. It informed the court that despite CPS having informed Sassa that it did not wish to extend the current contract beyond 31 March 2018, Sassa still depended on CPS “because no other alternative is currently in place”. Sassa, said the panel, had failed to develop and implement a contingency plan and had also failed to conduct an audit of existing cash pay points “with a view to minimising the number of social grant beneficiaries who need to be paid through this particular channel as from 1 April 2018, thereby reducing the the cost of providing social assistance”. In the meantime, SAPO had informed the Inter-Ministerial Committee on Social Security that the timelines Sassa provided with regard to its service agreement “are becoming increasingly difficult to meet”. Sassa had also, in the middle of this chaos, made the unilateral appointment of Rangewave Consulting, at the cost of R11-million, a decision later terminated on the instruction of National Treasury. Rangewave, owned by Patrick Monyeki, a former Home Affairs chief of IT, had headed up one of Dlamini’s “workstreams” that reported directly to her. Monyeki was part owner of SASSTEC, a group of companies including Integriton Integrated Solutions and which reaped lucrative government tenders. Integriton was awarded a R378-million tender by the Department of Correctional services. The experts said that in spite of the sense of urgency, Sassa had not made contact or initiated discussions with banks for the use of financial products already available to make direct payment into social grant beneficiaries accounts. National Treasury had told the panel that only one Sassa official had bothered to attend the first series of meetings with banks and that discussions had largely been driven by Treasury. The panel said the success of Sassa’s engagements with banks “would require Sassa to be open to solutions that are already available within the current bank technology and distribution capabilities”. However, most banks appeared unwilling to match the prescribed Sassa bank account specifications, particularly in the short term, because banks “cannot technically do what Sassa has currently requested without additional investment, which takes time to develop and implement, in addition to the business case being questionable if Sassa doesn’t positively and publicly communicate that beneficiaries should use commercial banks”. The subsidy offered by Sassa of R6.61, said the panel, is conditional on banks offering these prescribed account specifications. The banks could only assist Sassa if it shared information with them. It was the panel’s view that in engaging with commercial banks, Sassa had to be flexible with regard to its account specifications and be willing to pay the offered subsidy directly to beneficiaries. The subsidy would contribute to the cost of the banking products chosen by beneficiaries. Importantly, the panel said that acting Sassa CEO, Pearl Bhengu, at a meeting in January, had failed to inform the panel of correspondence from CPS received by the agency (and Minister Dlamini) three weeks earlier indicating that the company no longer wanted to do business with Sassa. In a letter, CPS CEO, Herman Kotze, wrote to Bhengu that the arrangement as envisaged by Sassa “will have a significant impact on the future of its business and operations”. “CPS is of the view that there is no need for Sassa to continue a relationship with it beyond 1 April 2018, whether in the form of a new contract or an extension of the current contract,” said Kotze. However, Sassa was of the view that the ConCourt’s order of March 2017 had precluded CPS from participating in any future tender for the payment of social grants. CPS, in turn, filed an application with the court in February requesting a declaration that the company is not prohibited from competing in future Sassa tender processes. The declaration was awarded to CPS on 23 February. The Constitutional Court will on 6 March consider an application by Sassa for a six-month extension of the current already extended contract. Sassa itself had undertaken to bring an application to the ConCourt seeking a suspension of the declaration of invalidity of the current CPS contract; “seemingly assuming that the court would necessarily grant the application, Sassa then continues that it would in such an instance apply for a deviation from the National Treasury”. In the end Sassa filed an application relating only to the cash payment to beneficiaries. Sassa has been consistently accused of failing to provide information to not only SAPO but also members of the panel and was asked in November 2017 to fully comply with “any present or future request” for information. In its latest report the panel said it was raising the matter as a concern and “not simply as a matter of compliance”. The withholding of information by Sassa, said the panel, was “a reflection of the lack of appreciation by both Sassa and the minister of the crisis ahead and the need for urgent singular focus on assuring their ability to pay grants without disruption from 1 April onwards.” [italics by panel of experts]. Sassa, SAPO and CPS were still not aligned with regard to what needed to be accomplished “and to reduce the risk of a national crisis on 1 April 2018”, the panel warned. The panel was scathing of Bhengu’s excuse that her failure to keep the panel abreast of developments had been “an oversight”. And while SAPO will partner Sassa in paying some of the cash payments, it will not be ready by 1 April. SAPO CEO, Mark Barnes, had written to the InterMinisterial Committee to complain that SAPO’s obligations to produce new Sassa cards was being hampered by Sassa’s first agreeing to card specifications and then later withdrawing these. Then there was the matter of the corporate holding account and special disbursements accounts which were not aligned to the SAPO/Sassa service agreement. Sassa, said Barnes, had not responded to the anomalies brought to their attention and also had SAPO’s model for an integrated grants payment system built utilising SAPO’s current core banking platform. The panel said in the absence of a credible contingency plan for 1 April 2018, Sassa’s apparent expectation was that the court would unconditionally grant the orders indicated in its application in the absence of a proper phase-out agreement with CPS. Sassa’s senior leadership, with a few exceptions, did not have the knowledge, experience or even the will to fulfill the Sassa mandate, said the panel. The panel found that one of the root causes of the current social grants turmoil was due to “a lack of proper stewardship of the payments of social grants including from Minister Dlamini”.